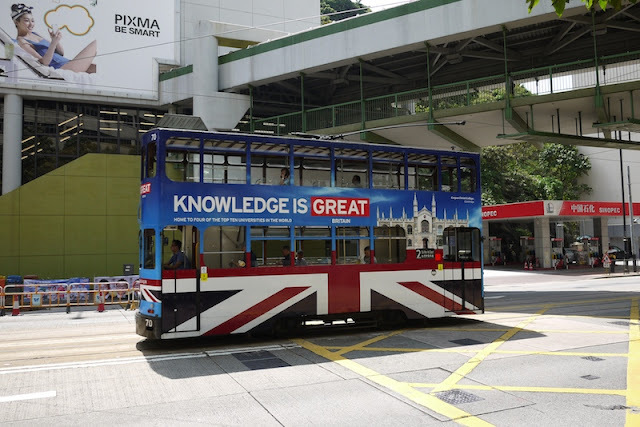 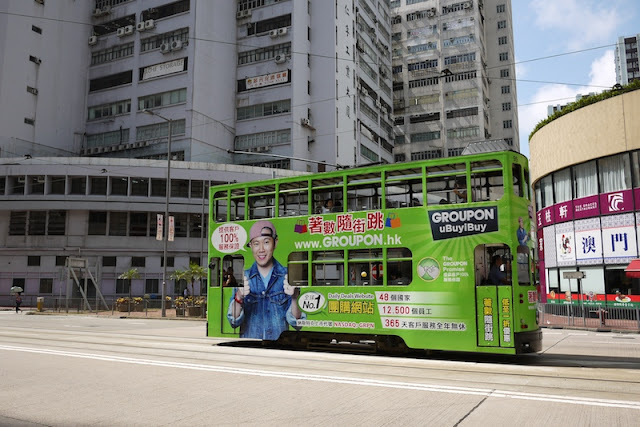 Almost exactly one year ago, I shared photos of advertisements on Hong Kong's double-decker trams. 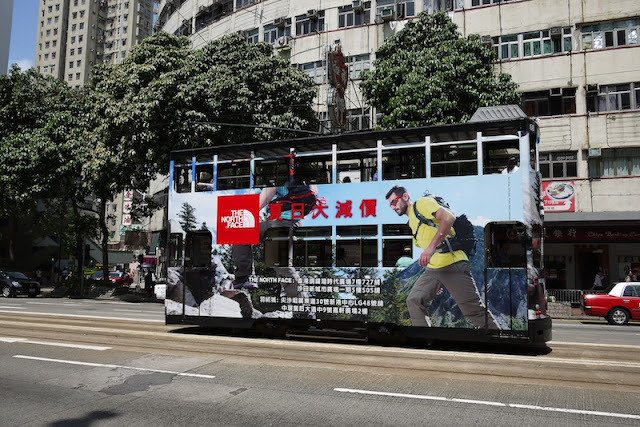 The unique canvas trams offer, their stop-and-go nature, and the wide range of activities engaged in by potential viewers can all be factors relevant to the design of effective tram ads. 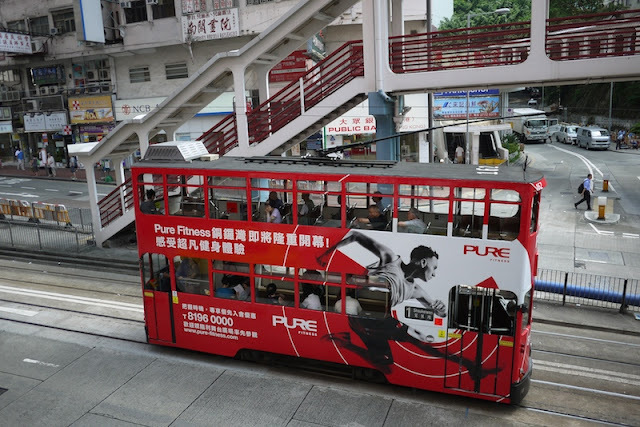 For me, contemplating the design of ads for less-than-common environments and how such ads are experienced by viewers can inspire new ideas for how ads could be effective in environments created by online services or software applications. 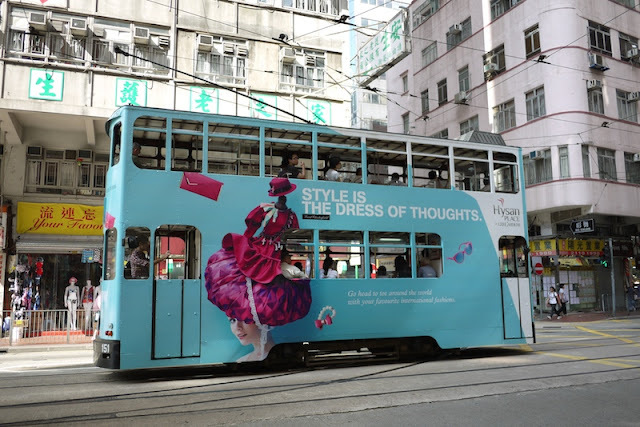 The tram ads also interest me because I am curious to see which companies are making marketing efforts in Hong Kong and how ad designers are approaching Hong Kong's unique conditions and mix of cultures. 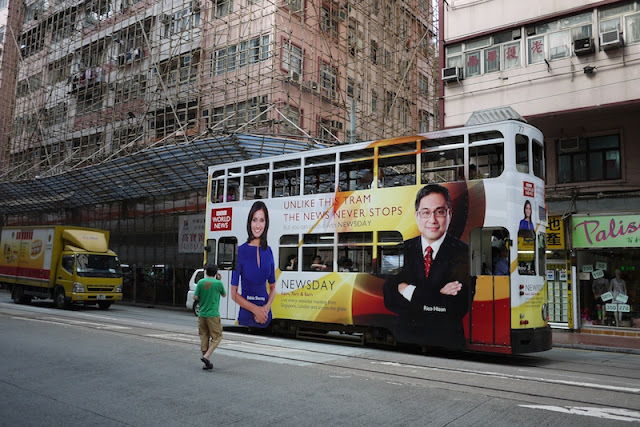 Personally, the slogan "Unlike this tram the news never stops" makes me want to groan. 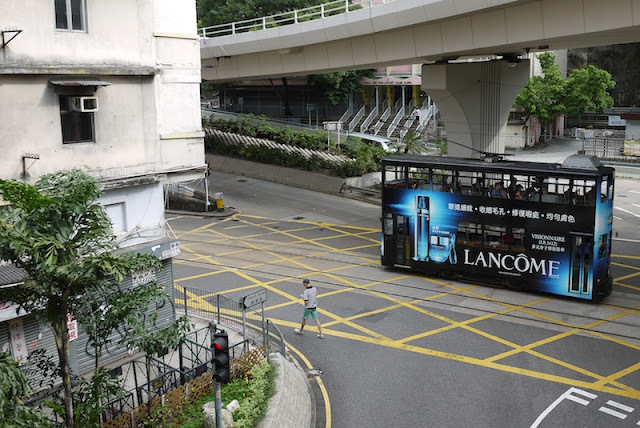 But whether the ad influences its intended target audience as desired is a more important issue. 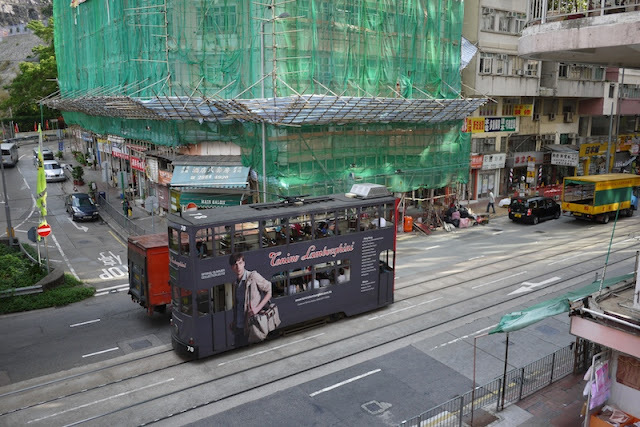 Regardless, it is notable how the creators of the BBC Newsday ad took advantage of the ad's environment. 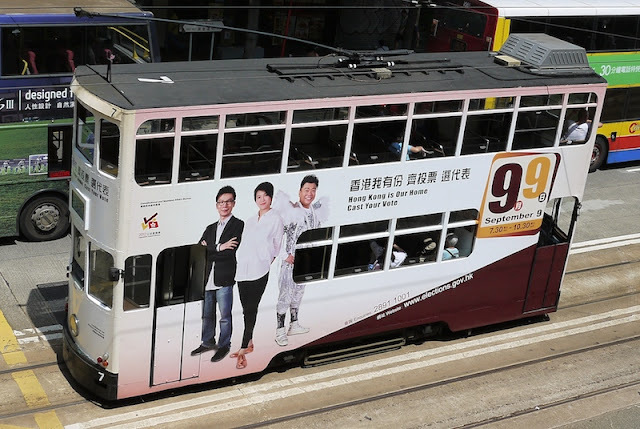 A campaign encouraging citizens to vote in government elections may not seem significant until one considers the unlikeliness of a similar ad appearing in mainland China. 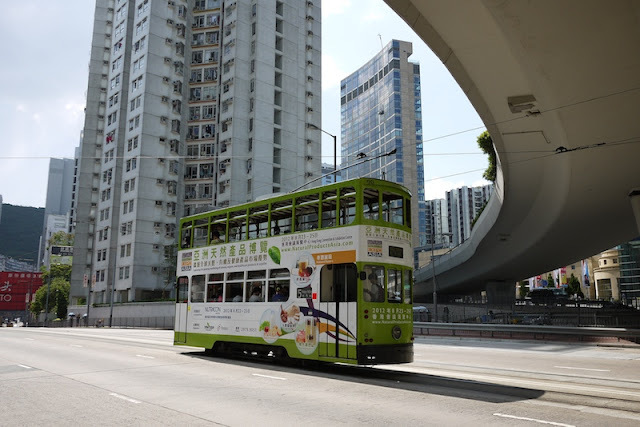 Elections where there are genuine choices to be made by citizens is one of the ways in which Hong Kong is a "special" place in China. 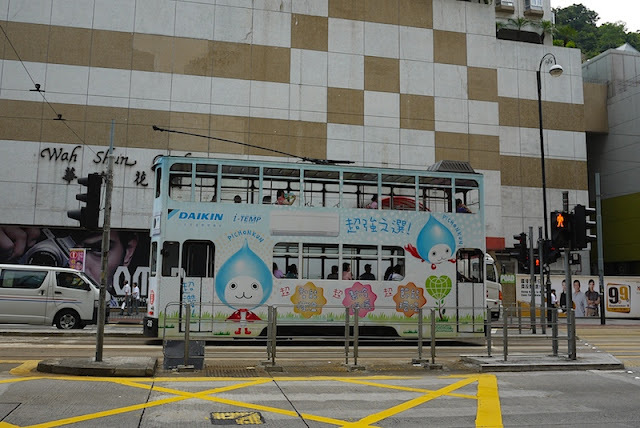 In the spirit of updating my earlier post, I will share a new set of tram photos. 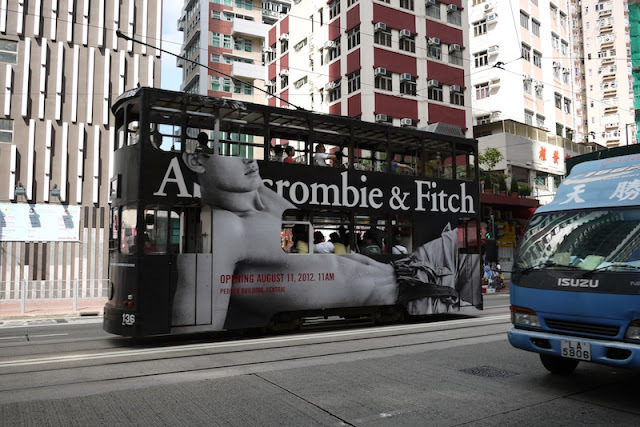 They were taken in mid-August of this year in Hong Kong's Eastern District. 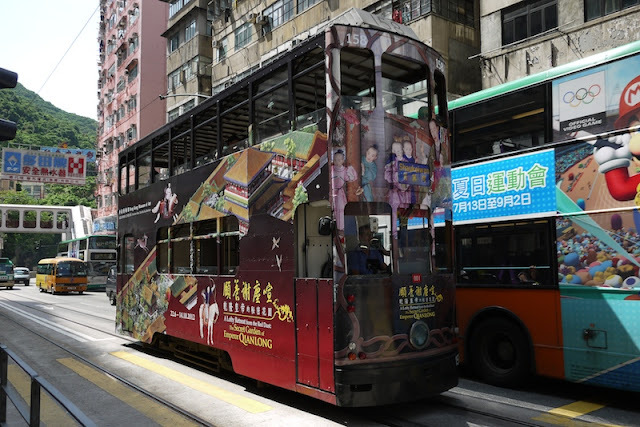 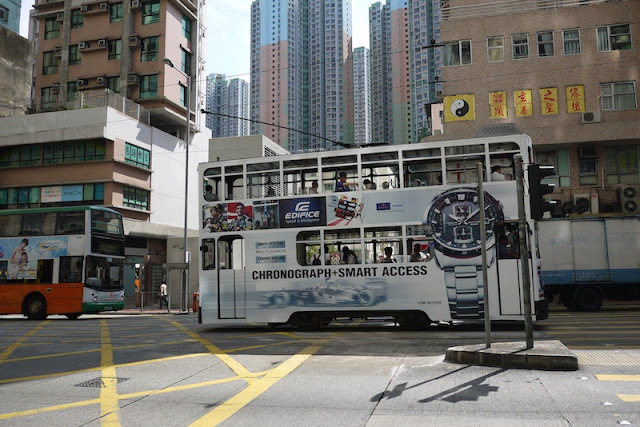 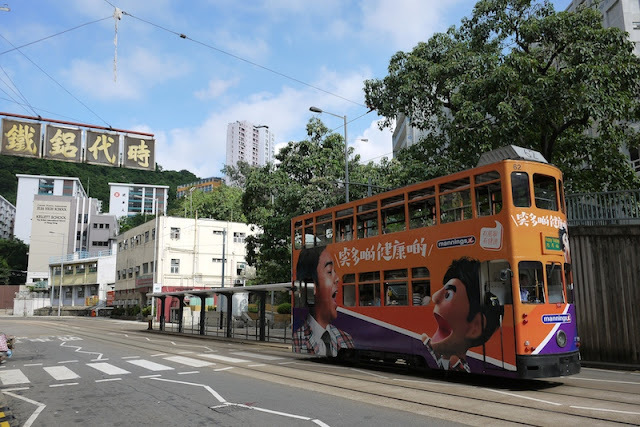 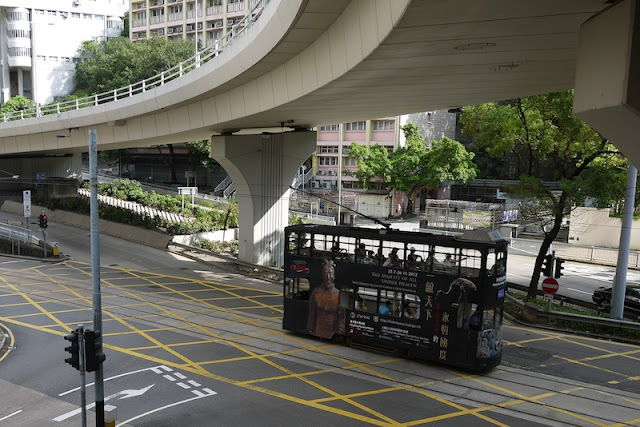 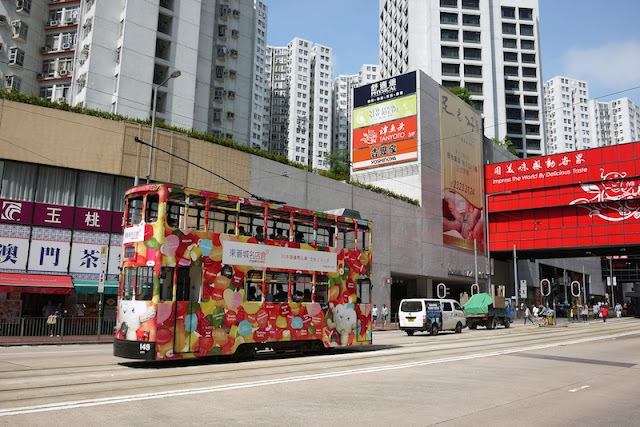 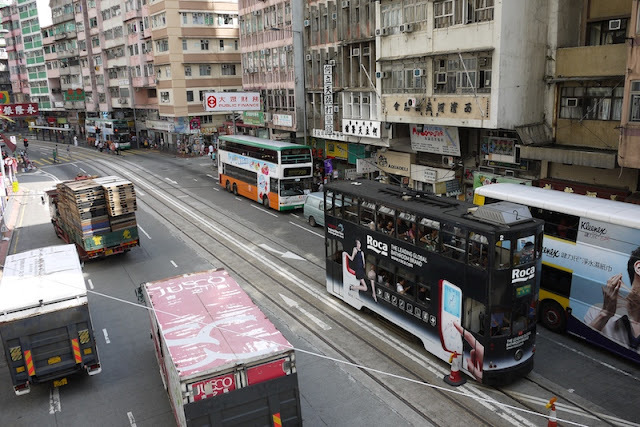 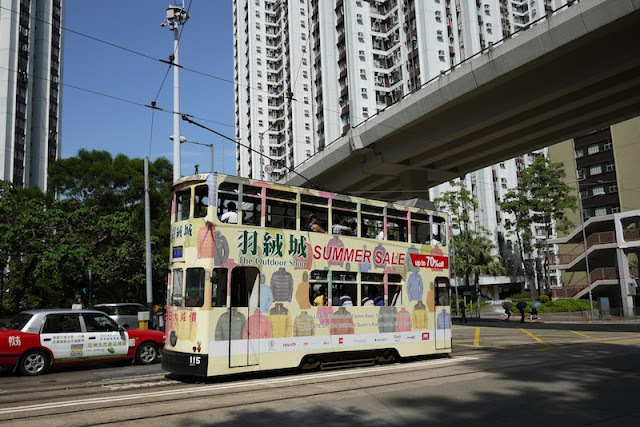 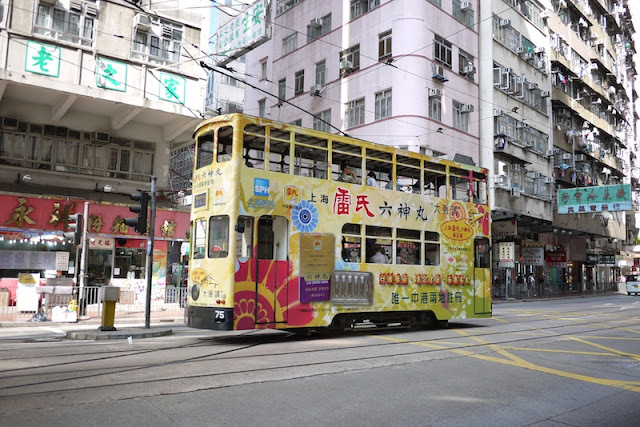 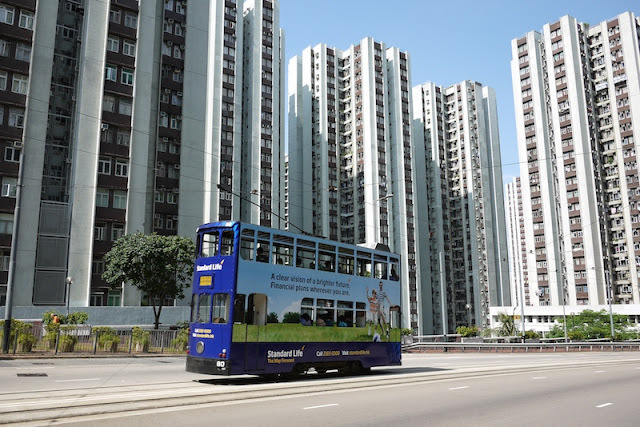 Even if one has no interest in advertising strategies, the photos can be appreciated for the striking visual contrast the trams provide in a variety of Hong Kong Island city scenes.